Election season is upon us! Many of our members have been out registering voters and preparing to conduct candidate forums in Kerrville, Bandera, and Blanco. Early voting begins Monday, October 22 and ends Friday, November 2, with Election Day following on Tuesday, November 6. The Voters Guide and VOTE411.org will have updated candidate information for the general election prior to the start of early voting. Encourage your friends and family to use these useful tools to inform themselves about the candidates. And take someone with you to the polls! 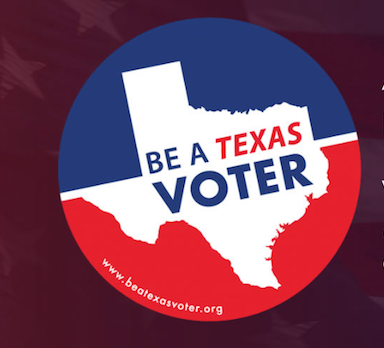 The League of Women Voters-Hill Country will conduct a candidate forum featuring the two candidates for Texas House of Representatives District 45 on Tuesday, October 16 from 6:00 pm to 7:30 pm. The forum will take place in the large conference room at the Blanco Library, 1118 Main Street (Highway 281) in Blanco. Texas House District 45 is comprised of Blanco and Hays counties, and the two candidates on the election ballot are Erin Zwiener (D) and Ken Strange (R). Forums conducted by the League of Women Voters-Hill Country are free and open to the public with a focus on audience questions for the candidates. 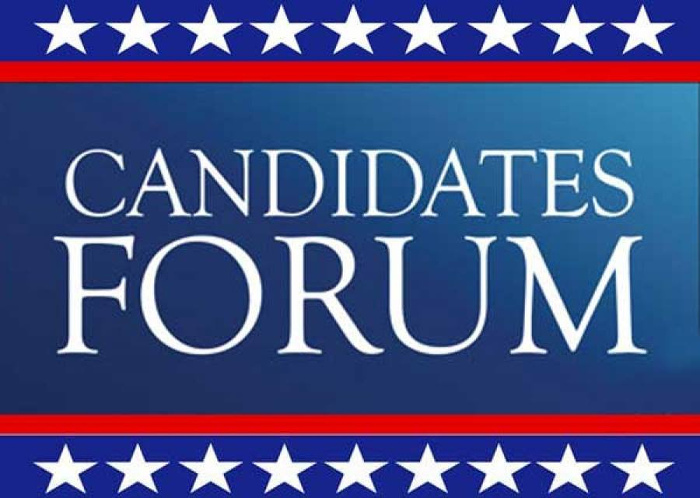 Candidate forums conducted by the League of Women Voters-Hill Country include League members who are skilled in organizing candidate forums for elections. A League member moderates the forum, with each candidate making an opening statement and a closing statement. Members of the audience attending a candidate forum may submit a question by writing the question on a card provided by the League. Each question is screened by two members of the League and given to the moderator. Each candidate answers the question with a League member serving as a timekeeper for the response time. This candidate forum is not affiliated with or hosted by the Blanco County Library. 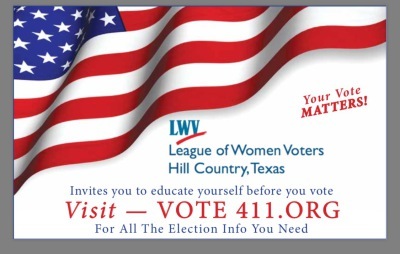 Please address all inquiries about this forum to the League of Women Voters - Hill Country at the following email address: presidentlwvhc@gmail.com. The League's nonpartisan Voters Guides will be available soon. These well-known guides are distributed free to civic organizations and public libraries across the State to help voters learn about candidates and issues. The electronic version of the Voters Guide, VOTE411.org, is accessible to voters worldwide, 24 hours a day, 7 days a week during election time. The electronic Voters Guide can be printed to take into the voting booth. However, mobile phones are prohibited in the voting booth, so the Voters Guide must be on paper, not stored on a mobile phone. To find the polling location for your precinct on Election Day, please visit the appropriate website above. The future is TEXTING! Thanks to the extremely generous Fund A Need donors, LWVTX has texting. They are scheduling voting reminders leading up to the Nov. 6 election. 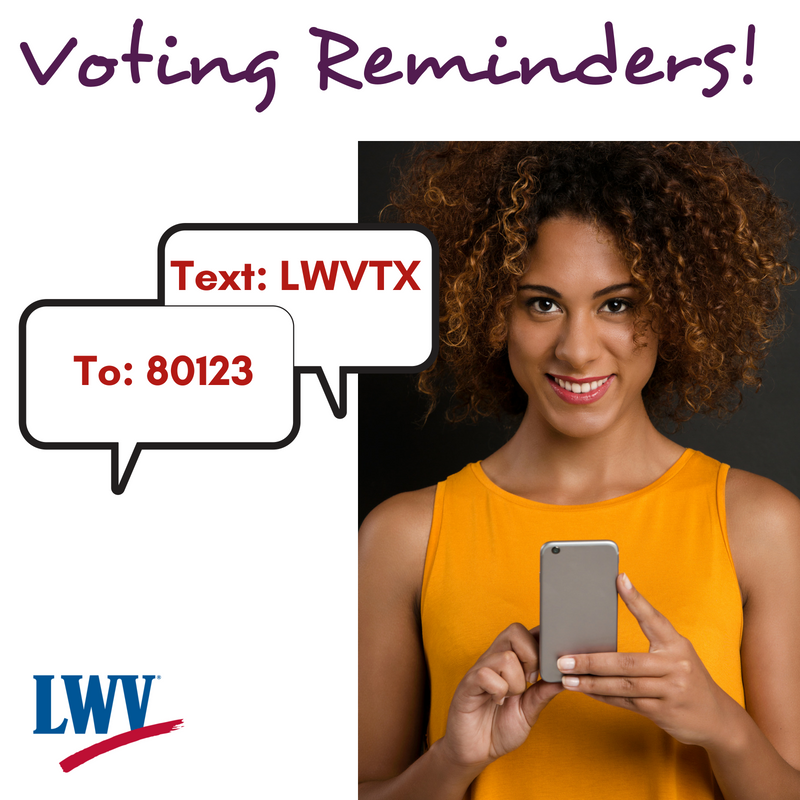 Individuals can text LWVTX to 80123 or sign up on their website. The League of Women Voters-Hill Country is one of many charities that benefit from Belk’s semi-annual charity sales. This year's fall charity sale is scheduled for Saturday, November 3, from 6 a.m. to 10 a.m. The four-hour, private ticketed event in-store only is a fundraising tool for participating organizations that sell $5 tickets to their friends, family, and supporters. All ticket holders will receive $5 off their first purchase. 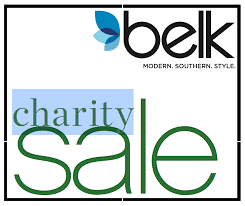 On the morning of the Belk Charity Sale, the first 100 customers to arrive at the store will receive a Belk gift card ranging in value from $5 to $1,500. In addition, one lucky person per Belk Division (a total of two winners) will walk away with a gift card worth $1,500, no purchase necessary! Not only is the event an opportunity for customers to take advantage of special in-store discounts on purchases during the event, it is also a great way for them to support local nonprofits. Please contact Mary Ellen Summerlin at meskt@icloud.com to purchase tickets for the event. The November general membership meeting will be held on Thursday, November 8, at Riverhill Country Club, from 5:30 to 7:00 p.m. Maggie Megee will serve as moderator for the meeting. Please make reservations with Debby Berry at dbbybrry@aol.com by November 1st. Benjamin C. Montoya, Ph.D., Schreiner University Assistant Professor of History, will give a talk about the historical development of voting rights in the United States. According to Professor Montoya, “the concept of who comprised the voting public has changed massively from the late eighteenth century to the mid twentieth century.” This lecture will describe the social, political, and economic forces that underlined the evolving nature of the people , and how the U.S. Constitution has at various times spurred on the expansion of voting, while at other times retarded the growth of suffrage. He will touch on themes such as immigration, naturalization, war, race, and gender. 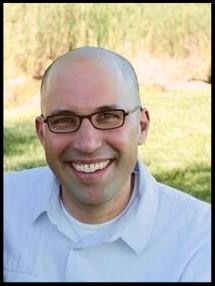 Professor Montoya earned his Ph.D. from the University of Colorado, Boulder in 2015. He studies U.S.-Mexican relations. His article, entitled “‘A Grave Offense of Significant Consequences’: Mexican Perspectives on the U.S. attempt to restrict Mexico’s immigration during the late 1920s,” was published in May 2018 by the Pacific Historical Review . His book, tentatively entitled Risking “Immeasurable Harm”: The Diplomacy of Immigration Restriction in U.S.-Mexico Relations, 1924 to 1932, is under contract with the University of Nebraska Press. He was also a co-editor of and contributor to Beyond 1917: American Legacies of the Great War , which was published by Oxford University Press in 2017. Professor Montoya lives in Kerrville with his wife and two children. Our League’s annual dues are $60 for an individual or $85 for two in a household, and $25 for student memberships. Dues are prorated from January. Please include your name(s), address, email address, and phone number. Make your check payable to LWV-Hill Country and mail to LWV-HC, PO Box 290303, Kerrville, TX 78029-0303. Join the League and help make democracy work.